19. The National Security and Intelligence Service (NSIS) is not part of the Sudan Armed Forces but is part of the Ministry of Interior (currently headed by Zubeir Beshir Taha (NCP) in the Government of National Unity). 20. The NSIS was formed in February 2004 as a move to create one unified service dealing with both internal and external intelligence. Its main headquarter is in Khartoum and is headed by a Director-general who is appointed by the President. The current Director-General, Major-general Salah Abdallah (also known as Salah Gosh), reports at least every second day to the President and/or First VicePresident. While he co-operates with other organs of the Government, he is accountable directly to the President. 21. 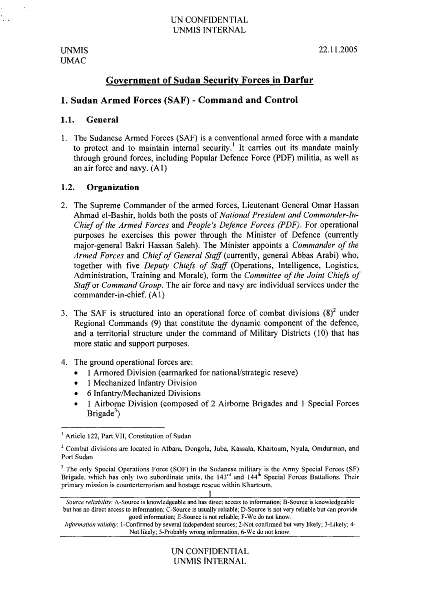 Its mandate derives from the National Security Force Act (NSF A) of 1999, as amended in 2001, which states that there shall be an Internal Security Organ in charge of internal security, and a Sudanese Intelligence Organ in charge of external security. In February 2004, the two organs were merged to form the NSIS. 30. Although we do not consider Janjaweed as being part of the GoS apparatus in Darfur, we mention it in this report for clarification purposes. 31. The term “Janjaweed”, in particular, has been widely used by victims of attacks to describe their attackers (the words fursan (horsemen, knights), or mujahedeen). The term has consequently also been used by many international organizations and the media in their reports on the situation in Darfur, and was used by the Security Council in resolution 1564. Victims of attacks have indicated that the Janjaweed were acting with and on behalf of Government forces, but no evidence – at this stage – allows to confirm such allegation.